This service runs inside the Park. Please note that animals are not visible from the trams or buses. There are three tram stops inside the Park: North America, Africa and Junction Plaza. The Junction Plaza tram stop lets guests travel in either direction. See Park Map. The wait time for a tram or bus averages 30 minutes. During heavy visitation periods, the wait may be longer. In-Park transportation service operates from 9 a.m. until 30 minutes after closing. Trams and buses do accommodate strollers and wheelchairs. Strollers must be emptied and folded for storage before boarding. This service runs outside the Park between the North America and Africa parking lots. The shuttle stops are located a short distance outside the ticket booths at both the North America and Africa entrances. Use this service if you finish your visit at the opposite entrance from where you parked your car. It is faster to use the parking lot shuttle than the in-Park tram or bus. 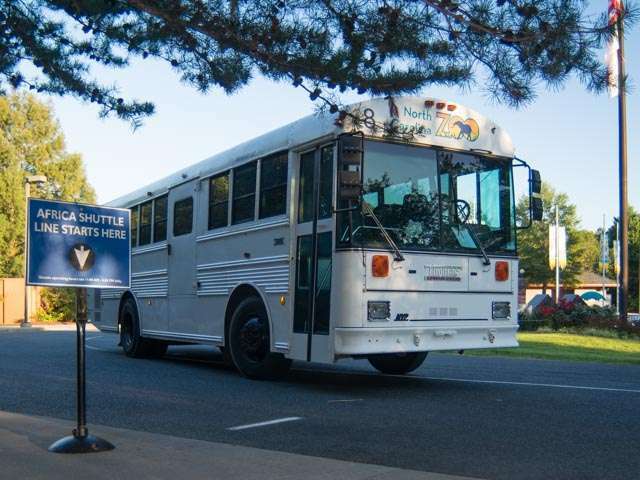 Parking lot shuttle service operates from 11 a.m. until 30 minutes after closing. Is there a separate charge for the trams or parking lot shuttles? There is no charge for guests to use the in-Park tram or parking shuttle services. Where does the in-Park tram service take me? 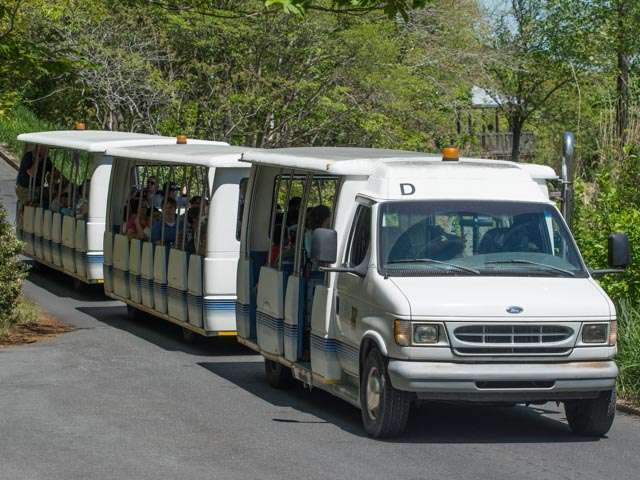 The in-Park trams and buses transport you from one part of the Zoo to another. Animals are not visible from the trams. There are three stops: North America, Junction Plaza and Africa. I do not want to empty and fold my stroller. I have a lot of stuff. Can't I just take it on the bus or tram with me? Guests will need to empty and fold strollers for guest safety and storage in order to ride one of our trams or buses. Why do I have to empty and fold my stroller? Strollers must be emptied and folded in order for us to safely store your stroller and have room to accommodate others. Do I have to take all of my belongings out of the stroller before folding? If the stroller is able to be folded and secured without removing everything, you may leave belongings in it, but the Zoo is not responsible for any lost, stolen or damaged items. Can I see any animals from the in-Park tram route? The in-Park trams and buses do not provide a tour of the animal habitats. The animals are best seen from the walking trails. Are the trams and buses accessible for wheelchairs? Yes, all of the in-Park trams and buses, as well as the parking lot shuttles, are wheelchair accessible. How long is the wait time between trams or buses at each stop? The average wait time between pickups at each stop is 30 minutes, but it will vary depending on the attendance in the Park on the day of your visit. Will my double stroller fit in the queuing line? Most strollers including the Zoo's rental strollers (single and double) fit through the queuing lines at each of the tram stop locations within the Park. Instead of taking the shuttle, can I walk from one parking lot to the other? Yes, the Zoo provides a Connector Trail (open April-October, 9 a.m. to 5:30 p.m.) that allows guests to walk between both parking lots. This is a gravel trail through deep woods that is approximately 1.4 miles long. Walking time varies from 15 to 40 minutes between the Africa ticket booths and North America ticket booths. For your safety, please do not walk on the sides of the Connector Road. This paved roadway between parking lots is open for vehicle traffic only.